In recent yearsx and months IP has become a very important part of the radio broadcasters technical toolkit. As an audio technology company with a fast-developing range of audio distribution products, we have experienced and responded to rapidly mounting demand for IP capability. Broadcasters see IP as a way of achieving a number of goals, and of developing a far more flexible way of operating. Where is IP used in audio production? IP of course has its place in both the studio and outside it. These two situations impose different requirements on the technical solutions used. Within the studio the quality of the IP line is within the control of the user, and as a result theres less need for measures that compensate for variable quality. Its a different story when IP is used for distribution from the studio to transmitter sites. In this situation, public lines are often used, and the lines may cross quite remote terrain. Quality can vary from fairly good to poor, and broadcasters need a way of achieving good quality streams in spite of this. Error correction is crucial in this context, to ensure that the IP packages are received securely. Integrating FEC (Forward Error Correction) provides the means to do this, and with 2wcom products we implement FEC with very variable parameters to allow for a wide range of operating conditions. The implementation is also compatible with DVB MPEG Pro, which means that there is no problem with interoperability, and customers are not locked into a proprietary solution. Whats the attraction of IP in audio distribution? The trend for radio broadcasters is towards the development of infrastructure that allows flexibility and provides robust backup options in the case of failure. IP streaming over public lines is a cost-effective distribution method that can be used in addition to other distribution paths to provide backup when the main signal fails, or to deliver regionalised programming, or indeed as the main signal. Broadcasters are turning to IP partly as a response to rising costs in other distribution methods, and partly because a new generation of technology is making IP a more viable option for delivering high-quality streams to the antenna. To take an example, if a broadcaster rents a dedicated line it may cost 300 per month, but with two DSL lines at 40 each, the broadcaster can achieve a similar quality level with the right technology managing the streams. And, with the dual DSL lines, not only is there the cost saving, but theres also the backup line if one line fails. Although the DSL lines are inherently lower quality than a dedicated line, the latest generation of technology can compensate for this and create a high-quality stream for transmission. 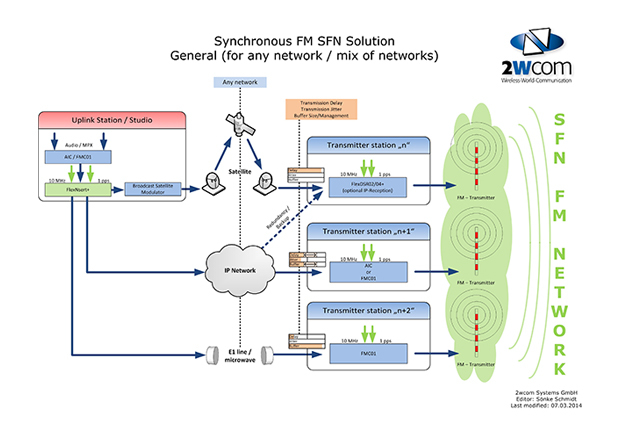 2wcoms FlexSource Distribution Receiver Decoder can monitor multiple sources, continually comparing the streams packet-by-packet; when a packet is lost in one stream, the receiver takes it from the other source and inserts it into the output stream. In the event of a failure of the studio link, the receiver can also continue to produce a stream from broadcast from an alternative source such as Shoutcast or Icecast, or from content stored in its internal memory. Its the ability of the receiver to construct a high-quality stream from lower-quality sources that opens up the potential of IP over DSL lines for audio distribution, and given the option of a lower-cost distribution method that also includes a backup capability, many broadcasters are going down this route. Is IP more flexible too? IP is important to broadcasters as one of a bouquet of sources, possibly in combination with E1, ASI, or satellite. With all of these options available, networks can create a wide variety of infrastructure configurations to suit differing conditions. But theres another way in which flexibility is becoming more important in audio broadcasting. With continually evolving infrastructure, broadcasters are presented with options that change from year to year. Satellite, IP, new fiber roll-outs and other possibilities may all at some point offer advantages to the broadcaster, and its crucial not to be prevented from switching between them, by a product choice made today. So more and more broadcasters are demanding technology that supports all the distribution methods within a single unit, leaving them free to explore any new option that becomes available or offers better value in the future.